Mr Sabin Shrestha is an Advocate and Executive Director of Forum for Women, Law & Development (FWLD). During his career he has been deeply involved in the field of law reformation and policy development primarily on matters relating to discrimination against women and marginalised groups. He is also known as a champion advocating for legal identity and citizenship rights and has been involved in research projects regarding citizenship, such as Acquisition of Citizenship Certificate in Nepal: Estimated Prevalence (2013), Analysis of Nepalese Citizenship Laws from a Gender Perspective (2014), Acquisition of Citizenship Certificate in Nepal: Understanding Trends, Barrier & Impacts (2014), among others. Apart from this, he also works in the promotion and protection of economic and social rights in Nepal. Along with years of experience in public interest litigation on various human rights issues, he was involved in providing paralegal trainings and preparing various para-legal training packages. 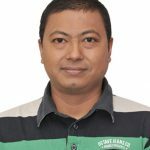 More recently, after the devastating earthquake in Nepal, Mr. Shrestha has been involved in leading and providing technical backstopping to legal assistance desks which were established in the 14 most affected districts. He has been equally instrumental in analysing disaster management laws from a human rights perspective and advocating for right-based responses to disaster-affected people. He is also currently engaged in Gender and Social Inclusion Monitoring of Post Earthquake Response and Reconstruction.